Some parts of your body tend to lose muscle tone faster than others. Your thighs are one of those areas. Luckily, there are exercises to lose upper thigh fat that can be done at home or the gym. Most can be easily incorporated into your workout routine without any difficulty. These exercises not only slim your thighs, but also help strengthen your legs, work out other parts of your body, and create a better overall physique. Lunges are great because they work out several areas of your lower body as well as strengthen your joints. They are often incorporated into exercise regimes because they are a very versatile exercise. Stand with your legs together. Step forward with one leg. Bend both your knees while lowering your hips until knees are bent to a 90 degrees angle. Pull back leg forward and return to starting position. Switch legs, stepping forward with the opposite leg. Do 10 reps for 3 sets. Climbing stairs does wonders for your lower body, including your thighs. It is great for strengthening your legs, toning your thighs and buttocks, burning fat, and increasing your heart beat. An effective cardio workout, the key points of this exercise is to take your time, watch your step, understand you can accomplish the same task on an incline on a treadmill, and wear the proper shoes. Want to know how to lose upper thigh fat? Try seated leg raises. This exercise works great for the front of your thighs, but is good for strengthening your joints as well. Sit on a chair with arm rests. Place your feet on the ground, keeping your knees at a 90-degree angle. Place your hands on the arm rests to balance yourself. Exhale out, lift your legs, and extend it out. Hold the position for 25-30 second, breathing in and out normally as you do. Inhale as you lower your legs. Repeat 10 times for 3 reps. This exercise can be done at home or at the gym. It is designed to burn fat while slimming your inner upper thighs. Sit on chair with knees bent and feet on the ground. Place a pillow between your knees and thighs. Take a deep breath and then exhale as you squeeze the pillow as hard as you can between your thighs. Hold the squeeze for 45-60 seconds, breathing in and out normally. Release and inhale. Repeat 8-10 times. Squats are a whole-body exercise that also targets your upper thighs. It uses your own body weight as a resistance that makes your muscles work hard and burn fat. A basic squat can be done anywhere, which makes it an ideal exercise when on travel. Stand with your feet at shoulder width apart. Bending at the knee, slowly lowering your upper body down into a sitting position as if you are going to squat on a low stool. Keep your back straight, abdomen pulled in and your arms straight forward for balance. You want your knees positioned above your ankles. You have gone low enough when your thighs are lined up parallel to the ground. Slowly raise your body back up until you are standing again. Repeat 8-10 times for 2-3 reps. This is another exercise that is great when you are on the road. It can be done anywhere, indoors or outdoors, as long as you have a sturdy wall to lean on. Want to know how to lose upper thigh fat? Do a wall sit or two. Find a sturdy wall and sit with your back and head against it. Position yourself so that your feet are shoulder width apart. Slide down the wall until your body is in the squatting position and your thighs are lined up parallel to the floor. Hold 30-60 seconds. Rise to standing. Rest. Repeat 8-10 times. Increase holding times as you increase strength. 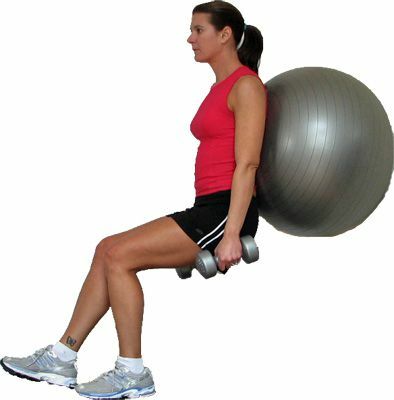 Ball squats require an exercise ball that has been inflated and as you get stronger you can add hand weights. It is an effective exercise to increase leg strength and tone your thighs and buttocks. Stand with your feet about shoulder width apart. Lean against an exercise ball, placing it between your lower back and the wall. Bending at the knees, lowering your body 6-8 inches. Hold 4-5 seconds and then lift back up. Repeat 6 times, eventually 12 times, for 2 reps. You can add hand weights as you grow stronger. Stand holding a chair with your hand. Keep your feet together and your back straight. Slowly lift your left leg outward to the left, in a sweeping motion. Lift as high as you can, stretching it as you do. Be careful not to lift too high and overstretch your muscles. Let leg slowly return to original position. Repeat 10 times. Turn, switch sides and repeat on other side for 10 times. Do 3 reps on each side. There is not only one way on how to lose upper thigh fat. Changes to your diet can help as well. If you need to lose weight, then you need to cut calories from your diet. The best way to do this is to cut 250 – 500 calories from your daily intake. This equates to 3,500 calories a week, which is equivalent to one pound. Add this to the calories you are burning while exercising and it makes quite a difference. It is recommended you eat an average of 30 grams of daily fiber. Most people don’t eat enough, which is bad for a diet because fiber is beneficial for weight loss and healthy eating. Most foods high in fiber are also high in nutrients yet low in fat. Fiber-rich foods include vegetables, fruit, legumes and whole grains. These foods also make you feel full faster and longer. On average, only 25-30 percent of your dietary daily calorie intake should be fat. Of the fat calories you eat, you should try and get them from good sources like unsaturated fats like olive and canola oils, avocados, nuts and seeds. Keep saturated fats to a minimum.